The evening of Saturday, February 10 was freezing cold. The bone chilling cold and skin-shearing winds the organizers were anticipating for the opening ceremonies on Friday, February 9. The cold did not chill, nor the winds destroy during the opening ceremonies. In fact, with enough layers and a little help from the organizers, spectators were able to watch without a thought to the cold. On each seat, there was a vinyl bag packed with things to keep us warm and to help us cheer. As you can see in the above photo, we had a blanket, a hat, and most importantly, a seat cushion and a heat pad that could be slipped into the cushion. Other heat pads, packs of squishy chemicals that warm up and stay warm as you hold and squeeze them. I had unfortunately lost my hat that afternoon only to find a hat in the bag, which I immediately put on. Together with my boots, a thermal undershirt and underpants, a shirt, a vest, a ski coat, a neck/face warmer, I was sitting pretty on my heated cushion. I didn’t need the blanket, and thankfully, there was no precipitation to require the rain poncho. One of the gifts was to be used during key moments in the program, when the lights would go down and everyone could turn on their mini-torch, a replica of the PyeongChang Olympic torch. During one of the most powerful moments in the program, when performers launched into a moving rendition of John Lennon’s Imagine, spectators waved their torches, imagining that one day, the world will be as one. Pita Taufatofua of Tonga enters shirtless…again. Definitely, the biggest question of the 2018 PyeongChang Winter Olympics was not whether more people would be added to the OAR team, or whether protests would break out in the middle of these South Korean Games, or how the Olympic cauldron would be lit. The biggest question was certainly – Would Pita Taufatofua, the taekwando-cross-country skier, enter the Stadium shirtless, as he did to universal glee at the 2016 Rio Summer Olympics. The Tongan did not disappoint. Fortunately, the temperature was only -2 degrees Centigrade, far below predictions of -15, so the oil-slathered Taufatofua could milk the crowd for ecstatic squeals of delight. But there were cheers a-plenty during the march of the nations. Nations with large teams like Norway, Germany, the UK and Canada got cheers, as did the nations with small teams, like Ghana, Singapore and particularly Tonga. The intriguing cheers came with the OAR crashed the house. Although it wasn’t finalized until the last day, 169 Olympic Athletes from Russia were allowed to participate in the Winter Olympics. They marched under the Olympic flag, and any medals won will not count in the overall Russia medal count. The largest team with 244 athletes, the USA entered the Stadium at a half run, and bounced along to the PSY hit song from 2010, Gangnam Style. But the biggest cheers were heard for the hometown favorites, the 145 members of the United Korean Team where a North and South Korean held the blue–on-white unification flag together as they entered the Stadium to tremendous applause. All photos and videos taken by the author. Doves vs Pigeons: A Symbol of Good vs Evil? One of the greatest memories for the 1964 Olympians from the Tokyo Games is the opening ceremonies – the parade of athletes, jets sketching the Olympic rings in the sky, the lighting of the Olympic cauldron. The only event to get lukewarm reviews? The release of the pigeons. To be honest, I was confused myself as Olympians, books and articles alike used the words “dove” and “pigeon” interchangeably. But aren’t they completely different birds? Doves are white. They symbolize peace. Pigeons are multi-colored gray. They symbolize disease in the urban environment. Pigeons are legitimately revolting. All the things we find loathsome are really caused by us, humans. We bred them to be massively productive and then we put them in a situation where we fed them all kinds of food and we created this food waste that they could eat. They reproduce like crazy and so they overpopulate and they’re all squished together and they get all these parasites and diseases. A lot of the things we find disgusting about them is a result of that. But as Mars explains in his 99 percent invisible site, pigeons have a proud and regal history. Historically, these were birds of the aristocracy. Researchers believe they were domesticated in the Middle East and then spread around Europe by the Romans. Their habitats were even built into the architecture of Roman houses: one common element of a traditional Tuscan Villa was an integrated lookout tower and pigeon house. In the 1600s, pigeons were brought to Canada from Europe; from there, they spread across the United States. Governors and dignitaries would exchange them as gifts and house them in domestic pigeon roosts. As they became more common and wild, pigeons began to lose their exotic appeal and fell out of favor with the upper class. This change in status is reflected in the evolution of common language as well: for a long time, “pigeon” and “dove” (of the same bird family) were essentially synonyms. Over time, the two diverged: “dove” was increasingly associated with positive things and “pigeon” became associated with the negative. Imagine, for instance, Pigeon Soap beauty bars, silky smooth Pigeon Chocolate, or the Holy Spirit descending from Heaven in the form of a pigeon. So now I know – a pigeon is a dove, a dove is a pigeon. One, an alter ego to the other, akin to the devil pigeon on one shoulder, and the angel dove on the other. Indonesia and North Korea pulled out of the 1964 Olympics. The Vietnam War was raging a few thousand kilometers away. China tested its first atomic bomb. Lyndon Johnson was facing off against Barry Goldwater in a testy US presidential campaign. The Soviets launched the first three-man spaceship. The Warren Report on the Kennedy assassination was released. On top of it all, in October, 1964, on the eve of the Tokyo Olympics, the health of the prime minister of Japan was teetering. In the first week of October, it was reported that Prime Minister Hayato Ikeda had a throat condition and might not be able to attend the opening ceremonies. Fortunately, when the Games opened on October 10, the prime minister was able to preside over the Games. Ikeda became prime minister of Japan in 1960 as the famed Japanese economic miracle really began to gain steam. In addition to building pension and health insurance schemes for the country, Ikeda created a vision of doubling the income of the Japanese by the end of the decade. 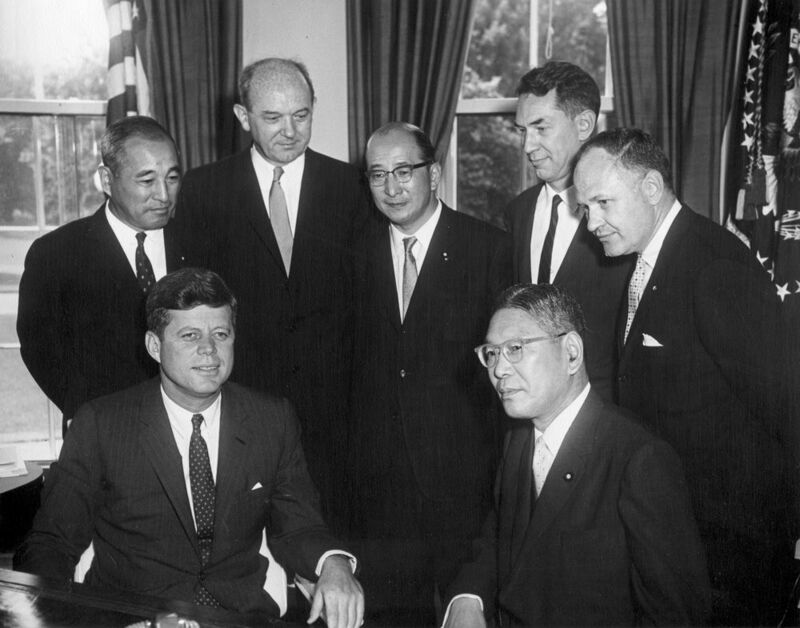 Akin to Kennedy’s moonshot vision, Ikeda captured the imagination of the country, and continued to preach that Japan’s economic success was just getting started. When the Olympic Games ended on October 24, the flame extinguished and the word “Sayonora” flashing on the large National Stadium screen, Japan was universally recognized for having emerged as a legitimate success story, from an Asian nation that re-built itself from the rubble of war to a powerful force in the global economy. Hayato Ikeda, who was born in Hiroshima a year before the turn of the century, was able to witness this as the leader of the country. And then a day later, on October 25, he announced his resignation. The tumor in his throat was simply not going to allow him to continue as leader. He was hospitalized for three months, had an operation in August, 1965, and then passed away on August 13, 1965.